I can’t say that I was desperate to go and see Eddie the Eagle in the cinema; it’s not that the reviews have been bad (because they haven’t), but more that it’s just not the kind of film that immediately stands out to me. However, going to see Eddie the Eagle made me realise that spontaneous plans are often better: no preconceptions, no desperation for the film to live up to its hype and consequently, a really enjoyable film watching experience. Featuring strong performances from both Taron Egerton and Hugh Jackman, Eddie the Eagle tells the true story of Eddie Edwards, British ski jumper who overcomes numerous hurdles in order to achieve his childhood dream of being in the olympics. What is so satisfying about this comedy drama is the way that despite his uniqueness, the comedy doesn’t usually come from mocking Eddie, the script is clever in the way that it allows us to laugh at all the pretentious people who can’t seem to understand that winning doesn’t matter in this journey. It’s the kind of story that your mum will love (mine certainly did), but with good reason, as the feel good factor is certainly present when you step out of the cinema screen. One of the things I loved about Eddie the Eagle is how well the film captured the colourful buzz of the late 70s and 80s. The brilliant soundtrack and costumes are the main factor in this, putting into life into an era that many of the film’s main audience (children) would never really have experienced before – the setting could so easily have felt dated but instead feels fresh and exciting. Yet Eddie the Eagle isn’t just a kids/family film, there are plenty of moments and innuendos we don’t expect from a PG rated film and if I’m honest, the themes of triumph and overcoming rejection are ones that are much more likely to resonate strongly with a more mature audience. It would be hard to leave this film without a smile on your face and despite a few tear-jerking moments, Eddie the Eagle really is the ‘feel good’ film of the year so far. Enjoyable for all, I would highly recommend Eddie the Eagle to anyone (like me) who isn’t sure what’s worth watching at the moment! 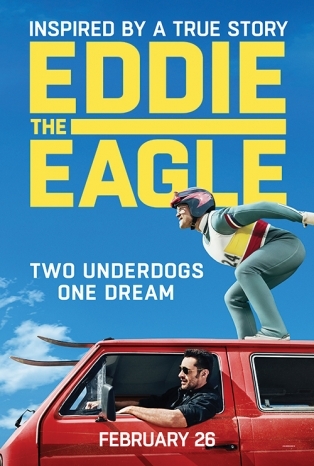 Eddie the Eagle is out now. This entry was posted in Uncategorized and tagged cinema release, eddie edwards, eddie the eagle, eddie the eagle full movie, eddie the eagle review, film review, hugh jackman, new release, tarot egerton. Bookmark the permalink.